"Maptitude - the GIS product for Beginners and Professionals"
Along with its excellent documentation and on-line Youtube video tips, the Caliper support team has been very helpful to me in resolving any technical issues and providing other datasets to support a consulting project. Besides the robust toolkit under the hood, the bundle of free data and the flexibility of the program as a spatial data conversion engine are very helpful to me as a planning consultant working with so many users of other GIS products. With Maptitude, I can build a project using many types of data and output the project files in virtually any format desired by the user. It's like having the Google language translator for spatial analysis and mapping applications! If a project uses some of the proprietary data layers from NavTech, a watermark is automatically printed on any map using these data layers and cannot be surpressed in the map set-up. Although the product works great as a spatial data converter to read & write to & from many data formats, it does not yet support ESRI ArGIS .gdb format unless you has an ArcGIS license installed along with Maptitude. The ease of use, the value of the product and supplied datasets and the quality of the technical and data support provided by the company and the user community makes Maptitude an unbeatable package for all kinds of spatial data analysis. I used to challenge college interns trained in ArcGIS to use Maptitude on various planning projects and, after taking the quick tutorial and working through the assignment, they unanimously preferred Maptitude over ArcGIS. The program cures many problems with ArcGIS datasets and ought to be used by every ArcGIS user to ensure toplogical integrity with every shp file in their library! - perform buffer analysis on hi-resolution land cover data to identify the extent of potential riparian forest gaps to improve surface and stream water quality through reforestation efforts. Of these latter two applications, the septic system project has helped define the need for public financial assistance to promote proper septic field maintenance & operation to improve water quality. The buffer analysis of riparian land cover has helped advance am EPA project to promote forest retention as a national water quality strategy to protect important estuarine environments like the Chesapeake Bay. Overall, this product makes it incredibly simple to visualize and map both customer & company specific data. It is very intuitive and easy to pickup from the get go. I highly suggest utilizing a quick training video or session as it will improve your usability 10 fold with just a few tips & tricks. This product is incredible for what it was built for. The loading times have gotten a bit better, although when scrolling the map still will re-load each time. This is easily worked around and the teams there are working to have this improved with the various Way of Life changes added. Easy mapping of customer & company specific data. Very useful and quick to learn. I'm able to create territories that focus on simplifying our logistics network. Maptitude 2019 allows you to visualize data and provide upward feedback with easy to read & simplistic design. "Maptitude - Easy to Use and Powerful!" As a former MapInfo user, I like the ease of use of this product. It is much easier to do many things in Maptitude compared to tools like MapInfo, but there is plenty of power. Adding aerial maps is simple and the layer controls are easy as well. The price is also affordable. There really isn't much to dislike about Maptitude. I have been using it for about five years and I think the only thing that I find a challenge is how to remove old versions without removing data. As a result, I have left some of the old versions installed as the one time I did try to remove a previous version it took all the data with it and I had to restore it. We use this tool to look at consumer research calling areas, map store locations, analyze demographics and determine trading areas. "Create the best map and presentation designs in the easiest way." What I like most about this software are the spatial analysis tools. In addition to having good technical assistance to download cartographic information of the country you need. The only problem we got in the company was the installation of the program, since it was very difficult for us. On the other hand I think that the part should better design the graphics. It would also be important to develop it under the free software environment. The program is totally recommended, it is very easy to make the maps, due to the great variety of design tools and spatial analysis. The best thing about this program is that its source code can be edited and modified, unlike other software, if I can adapt it to my needs. "Maptitude is the best mapping solution out there"
It's highly detailed yet easy to use. There are so many things you can do, but it all depends on what you want it to do. It's very malleable to your specific business needs. There is a learning curve, with how many options there are it takes time to really get in a groove for your business. It's a total package for your business. You can customize so many things to help you run a more efficient and detailed company. Analytics. There are so many things that we are tracking now that we could not do before. Like tracking median household income by zip code. More data to help us be more efficient. We were looking for something to use in lieu of Business Analyst, and this seems to do the trick, but for $30k cheaper. I have access to traffic counts, local businesses, demographic information, drive times, and aerial imagery, all at the tips of my fingers. The program is easy to use, as well; I did not have to spend much time reading instructions in order top get going on it. Making layouts in Maptitude isn't quite as easy as in ArcMap, from what I can tell, every time I make changes to my map I need to make a new layout, as opposed to ArcMap where I am used to just working in layout mode to begin with. Also, I have yet to figure out how to make a point file from scratch. Also, the drive time rings are in increments as opposed to being able to set each ring separate (example: you can do drive times at 3, 6, 9, or 5, 10, 15, but not 1, 3, 5) . If you need something to make basic maps, or even demographic, traffic, drive time, and competition maps. Maptitude can do it. If you were making more complex customer analysis maps with Business Analyst, this may not be the right software for you. We saved a great deal of money and still have up-to-date demographics, traffic, and business information. We had been looking at renewing our severely out of date ArcMap with BA, which would have been over $30,000. Maptitude gives us up-to-date data for less than $1,000. I can make nearly identical maps with both programs. 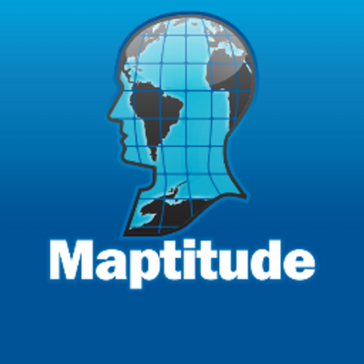 "Maptitude is an essential tool"
Ease of use, free US and world data, an exhaustive library of features, ability to automate tasks using GISDK, ease of training new users, amazing tech support, robustness and well thought-out user interface. After running a set up with a fresh build or version, often the new install will have a hard time using the data installed with the previous version. Maptitude is a feature-rich, easy to use GIS tool that performs well throughout the project cycle, i.e. from data preparation to analysis and reporting. Production of standard maps is easily automated if needed, and the software offers a huge library of data and functions to support complex map generation. In my opinion Maptitude should be installed on everyone's computer, just like word processing or spreadsheet software. It really is that good. We use Maptitude to generate massive amounts of maps each month for inclusion in reports. Nearly every single type of project we do benefits from Maptitude - it is our main tool for spatial data review and cleanup. For example, we use it to pre-process GTFS data for use in transit surveys and to analyze boarding and alighting data. In my earlier practice as transportation engineer, I used Maptitude to quickly estimate direction distribution of background trips for traffic impact studies of all sizes. I also used it to prepare and store land use and transportation system data for travel demand models. I consider Maptitude an essential tool in my transportation planning practice. Maptitude is a terrific GIS package. It does everything ARCGIS does but costs less than $700. And for $395 a year you get access to great datasets that Caliper generates for free. It is user-friendly and if you have a problem either Caliper tech-help or a Google search will get you a solution. The datasets include locations of all business brands, medical locations, schools, and so on. I really don't have anything about Maptitude that I don't like, except maybe the lack of a satellite view. I usually download to Excel or SPSS for modeling so I have not tried the modeling options. I map everything that I can. Maps help explain concepts, show relationships, and so on. And Maptitude can generate drive time as well as straight line distance matrices. "Everything one needs in a basic GIS system"
Maptitude is a very versatile GIS system which is able to produce a wide variety of Maps economically. The documentation for Maptitude could be better. The user guides and videos seem to be fairly basic and give examples of how to use only the most rudimentary functionality of the software. Excellent GIS demographic system. The system appears to be very versatile, almost too much so in that some knowledge of databases/data structure is helpful to truly utilize the system. The typical business person in the street will find this software somewhat challenging. Documentation IMHO is light but online support is very responsive and good. Based upon my limited experience so far one should expect to have to dig on your own/ask questions to get what one needs. Maptitude is critical for providing information in commercial real estate location selection. We are a non-profit organization and each year volunteers deliver gift bags to all 930 member families in the Denver-metro area.. This year for the first time I used Maptitude to generate delivery routes for the volunteers. For the first time in a dozen years, we actually received feedback that the routes were easy. It encouraged volunteers to help. Maptitude is comprehensive. There is a learning curve with it. But the results are accurate and outstanding. All addresses could be mapped with Maptitude, not one was left out. There is a learning curve. It does so much it's difficult to sift through the features you need for your application. Their technical help desk is very helpful but you need to be specific about the problem you are having. They are hesitant to give you more than a tutorial. Allow time to play with the program and experiment with its features to distinguish which you need. It takes time to figure out how to use the features you need. Delivery routes. Comprehensive, accurate and reliable. "Maptitude - GIS for the rest of us"
Ease of use, unlimited number of columns for attribute data (256 in most), excellent mapping done almost automatically or at any level of interaction you want, intuitive interface that remains that way when you come back to it maybe weeks later, lots of data at no extra cost, versions for several countries in the world, output an adjacency matrix which is needed for spatial statistics, spatial interpolation and overlay - estimating attributes of one geography from the known attributes of another (overlay zip codes with census tracts to estimate census variables in a zip code), buffering point, lines or polygons (and then doing spatial overlay), surface analysis, regression analysis (limited but you can export data to stat packages easily, map librarian which helps keep your maps organized, easily connect attribute data to a map, routing and drive time rings, integration with Google Maps. I have never tried to do anything I can do in other GISs that I cannot do in Maptitude - often not the other way around. Good export capability for use in other software. Excellent PDF manual, excellent tech support, videos for teaching yourself. Prince is less than half of other vendors. I would like to see more comprehensive statistical capabilities, spatial regression not just least squares simple multivariate regression. Likely more useful would be more descriptive statistics, better graphics support for charts that look better, but Maptitude is after all a GIS package - it cannot do everything. It is easy to export to SAS, R or Stata, Excel. It would be useful to have more raster GIS capability but I use GRASS for that and I can combine the data, analysis results pretty easily. That said, even if Caliper added more raster analysis (map algebra, spatial modeling with pixels, etc.) I'd have to go back to GRASS to do the heavy lifting and the same for spatial regression. ArcGIS has ostensibly more of this capability through expensive add-ons but I do not like the algorithms they use. I would like to see the scripting language changed to Python which has a lot of capability that the current one does not. But ... frankly I seldom need it. I do have to do a lot of programming for SAS and R. I can without hesitation say that there is nothing about Maptitude that drives me nuts or causes me any grief. I definitely cannot say that for the other GIS packages that I have worked with. The learning curve is less steep by far compared to other GIS, but it is not flat! Take some time to really get a through introduction. The manual has lots of "One Minute" exercises which get you a very long ways. There are videos which are very good. This has made teaching GIS much easier fo me and is a big time saver. You have to lean the basic operations thoroughly to get the most benefit. However Maptitude can be used at different levels. If you need to make simple maps, mostly thematic maps, then it is very simple. If you need to really complicated stuff- you can get as immersed as necessary. Spatial analysis of disease clusters. Mapping flight path coverage of emergency helicopters. Environmental justice: relationship of disease and causes of death to environmental hazards, toxic waste, power lines, road traffic noise and pollution to health status, Disease incidence (Bayesian regression modeling). A LOT of presentation mapping of health and demographic data for use by policy makers in government. There are two types of maps I make: 1) analysis maps. I do not care very much what they look like; I need the information for statistical modeling. 2) Presentation maps for legislators, publications, meetings with local health departments and citizens. A map will communicate and stimulate more discussion from everyone who is a stake holder in an issue more than charts and graphs and other clever visualizations. I teach GIS for use in public health. I can get students working on real problems in a couple hours with Maptitude. Other software usually requires several days to get up to speed to actually work a problem. Maptitude is incredibly user-friendly. It can be very intimidating to use a new geospatial tool without formal training. With Maptitude, I started with no training and quickly became the in-house expert at my company. The number of files created for each layer can cause a lot of cluster in file directories and sometimes previous maps may not work correctly if any of those files were misplaced or deleted on accident. Anyone with a quantitative background can quickly master Maptitude and enhance their analyses. There is no need for prior geospatial training. Stop considering and adjust your Maptitude! What business problems aren't we solving with Maptitude? We are locating new stores, optimizing existing footprints and quantifying local market opportunities. I learn something new every time I open Maptitude and it certainly has become the got to tool for our geospatial analytics. "A wonderful territory mapping program and then some!" Ease of moving territories, obtaining census data and plotting territories to that data. Beautiful interface and several ways to customize the product and exports. The ability to pull in my older Mappoint files and data was a huge plus! Great video tutorials that help you get started as well. The learning curve for this program is steep. The interface is nice but cluttered and until you have used it a few times, you will mess up more than you create. There are several buttons that should be together (especially when dealing with territories) After watching the tutorial videos (some a few times) I was able to understand the layout better. Watch the videos, Ask questions and enjoy this great product! It will not let you down! I use this software to assign sales reps their territories. Before, I would just assign them via zip code. Now, I can assign and balance territories between reps based on census data! I can also assign via other data and plan to do so as I get better at using this program. The amount of different options and command menus can be a bit unnerving at first, but their 'how to' videos, webinars, detailed manual can help you achieve most any task. And if you are stumped you can always count on an email to technical support will solve your challenge. It is well worth the modest investment. I work with retailers and government agencies helping them map data about their operations and their customers. Maptitude - more so than other mapping software - helps me portray key data fields in a map format. And the graphic quality when you save to a JPEG or PDF is outstanding. It offers very sophisticated features for power users, as well as being user-friendly enough for more basic users with less complicated needs. The support staff is always quite helpful. I have often wished I could "undo" an action and that isn't typically an option. I enjoy using this tool. It has a ton of features for those who need them and yet it's easy enough to navigate and produce output with more simple needs. The support is great and I highly recommend attending a training class or participating in a webinar to learn as much as possible. It's great to provide a visual depiction of where business is coming from or where opportunities may be located. The "lasso" feature has been a great addition to help us more easily identify a group of entities within a specific geographic area. "Fantastic mapping program. Excellent value." The program comes with many standard features including census tract which many mapping programs do not offer. Also many other optional features at no additional cost. I really can't think of anything negative to say. For me, Maptitude provides everything I am looking for. I highly recommend Maptitude. There is a bit of a learning curve but once you get the basics mastered it gets easier. They keep improving and adding to annual updates. I know that I have only scrached the surface as to what Maptitude can do. so I am still learning. I use Maptitude to locate real property with specific location requirements. Certain census tracts, located near various services like grocery stores, pharmacy, schools, bus stops, etc. Tech support over the phone is non-existent. Called multiple times, left multiple voicemails, never once get a call back. You can email support, but if you have an urgent issue you 're SOL. Too many random files are generated when you create a map, guessing its all the different layers. Then you can't move the map files out of the folder you put them in so better know where you want them the first time. Recommend some analytical experience, not for the casual user. You can, but be prepared to contact support to hold your hand. Definitely get a demo to learn some of the basics. We use the program to create map images for presentations. Was buying demographic data separately, can save that expense and pull it out of the maps. It's 2015 data, we were buying 2017, but it still works. Hi: Thank you for the positive comments! In regards to support calls, we strive to provide excellent support and our customer reviews reflect this. Please give us another chance in this regard because it seems that somehow you may have fallen through the cracks, which is very unusual. The basic mapping features within this program are easy to learn and customizable like no other mapping software I researched. I researched about 5-6 GIS products prior to deciding on Maptitude. More complex mapping and features (coding) are harder to learn and the training classes are fairly expensive. We use this product to map SNF, IL, AL and Memory Care facilities for seniors and to pull some demographic information for areas in which we have portfolios. The newest update of healthcare providers data has been helpful. Hi, Shaina: Thank you for the positive comments! Free training videos are here: http://www.caliper.com/training/MaptitudeVideoTutorials.htm . Maptitude comes with a PDF User Guide accessible under Help-Maptitude User's Guide in Maptitude. It is also available in the Windows Programs Maptitude folder, as are additional product specific user guides. This has tutorials for all aspects of the software and has a detailed tutorial in Chapter 2. Maptitude also comes with a detailed electronic help system accessible under Help-Contents in Maptitude. This also contains the 60-Second tutorials and can be accessed within Maptitude by clicking F1 on your keyboard for context sensitive help. But we would also be happy to talk with you about any issues. Please give us a call because we would be happy to help. Caliper's Maptitude makes mapping and geovisualization pretty painless once you've put in the hours to understand how it works. It loads data pretty quickly and you can make visual adjustments very easily. It's the go-to software at our organization for anything mapping related. I love all the features and data that this program has in it. It's a very comprehensive software that should cover all of your mapping needs. The learning curve is pretty steep. It definitely takes a couple hours of frustration to understand how to map things and to edit them to your specifications. Additionally, if you have an older version of this software (pre 2016), data loads very slowly and the map refreshes whenever you move, which was annoying. Maptitude definitely offers value for it's cost. I would recommend it to those in a business setting needing to visualize geographic information (such as sales by ZIP). The clearest benefits is geovisualization. It makes understanding what states, regions, or ZIP codes are performing well/poorly very easily and makes it easy to discern trends on a geographic level. "Easy to learn with lots and lots of features"
My firm likes the redistricting tools in Maptitude. What used to take hours in ArcView we can do in minutes now. The software has a lot of the same features as ESRI's products, but it is less expensive and you don't have to buy the add-on extensions to get the same kind of analysis. My firm changed to Maptitude about three years ago and it was the best thing that we ever did. It is a little awkward to learn how to create selections and sub-selections. But once you get this down, it really offers more query power than you expect. Absolutely give it a close look. It is a powerful GIS tool with a lot of functionality. They also provide far superior customer support than ESRI. The learning curve here is very fast and it is an incredibly intuitive product. Redistrict analysis is excellent with Maptitude. We also use the built-in data layers for analysis. We can build maps in probably half the time we used to take with ArcView. "Excellent value GIS / mapping tool"
I've found it really useful for both logistics and non-logistics projects. As well as being able to identify hot-spots in your own data and interrogate the built-in demographics, you can calculate weighted "centres of gravity", visualise size of flows and allocate customers between fulfilment centres or depots - all important features if you're looking at logistics networks. Not dislike, but like most people I have a wish list, which for Maptitude includes more up to date pan-European mapping (but I'd be the first to acknowledge that's not at all realistic at the price point!) and a faster routing function. My recommendation to anyone buying any software is to make sure that you understand the business questions and issues you want to explore, and then look at the packages available and how they match. Ask for a live demo, or look at the website to see static examples of analysis you can carry out and videos showing how it's done. If the demographic data is important to you, check what's included for the country you're interested in as it varies with what's available. As well as logistics projects, I've helped non-logistics clients to: identify sales leads and then prioritise them using the demographics; manage the schedules of field engineers by analysing the size of patch and workload; and carry out competitor adjacency analysis. "Maptitude excels in data point mapping"
I like the level of control I have each layer of mapping. I can now make maps to meet any need. Demographic marketing, zip code analysis of market strengths, best routes for access to clinics. Now I have more requests for mapping of our demographics and how we're impacting our communities. I also like that I can hide almost any detail on the map that's not necessary to the story I'm telling. Tutorials could use some refreshed examples. Training is done online, in person and via web tutorials. I would like to see Maptitude reach out to users for fresh examples of how they are using the software. Sometimes I can't reach support and have to call the sales line to get quick answers. And they are always accommodating with my questions. Color selections for styles should allow you to create your own custom color pallatte. Take it for a test drive and go through web tutorials relevant to your needs. I use Maptitude for a variety of business needs from analyzing customer concentrations to heat mapping customer demographics. Previously I had used MS Mappoint and it was no longer supported. Moving to Maptitude was easy and they have tutorials that show Mappoint users how to use Maptitude. "Maptitude is the Way to Go!" I discovered Maptitude in 1995 when it was first released and have used it exclusively in my health/hospital planning career. It has been indispensable in terms of product quality, affordability and ease of use. I was able to make a variety of custom maps of hospital patient data for executive-level decision support. There is nothing to dislike about Maptitude - it has gotten easier to use over the years and is still the "best bang for the buck." It is important to take advantage to training opportunities to understand the power of GIS and how best to use this important tool in describing information geographically. As stated above, I have used Maptitude since its release in 1995 after investigating other costly and difficult GIS products. Maptitude met all my mapping needs in hospital planning throughout the ensuing years at an affordable price considering all the additional features now available. I recommend that at least two people learn how to use Maptitude for back-up purposes if your company is large enough - don't let this valuable tool just sit there once you get it. Use it as much as possible to build skills and inspire ideas of mapping your data. As a hospital planner, and a geographer by education, I am continually able to emphasize the importance of knowing where your customers/patients live and the distance they must travel to access services in this competitive world. Opportunities and threats to business growth have been identified through geographic analysis. "The Best Mapping Software You'll Ever Need"
I've been using Maptitude since the mid-90's. I love the 3 & 5 digit ZIP boundaries and demographic data that comes with it. To be honest, we originally bought it because it was the easiest way to acquire Census data. Since then we have continuously used it for a wide range of client projects. I have to admit it has way more power than I have explored... they keep adding features - I've made tons of use of the themes (you can color the maps with backgrounds based on the included geodemographics). I've also used the band feature - retailers LOVE it. Its hard for me to say this is the best because I've never really tried anything else... but it is one product that you can get started with out of the box and never quite plumb the depths of. I recommend it ALL THE TIME! Its so powerful, it takes some getting used to - working with multiple layers and data sets. I can't say it is a flaw, some of the great features take a while to learn (it seems I'm more frustrated with myself than with the software). I would START with Maptitude - you don't pay tons of extra fees for different data sets - they give you more than enough to work with. It is the best deal - and they will work with you if you have an interesting puzzle which you think you cannot solve. We mostly like to plot customers then see how they 'fit' into geo-demographic theme areas. Amazing things jump out and with Maptitue, you can essentially re-score the variables to different geographical size by refreshing the map. So, lets say we have a client in Iowa. We'd like to see how their customers are distributed compared with median dwelling value. When you look at national averages - the whole state of IA is low value housing (compared with the coasts). But with Maptitude, we just zoomed into IA and recalculated the themes and found a wide variety of value areas. Voila! "Maptitude GiS by far the most powerful, easy to use and cost effective GIS solution out there." I have used Maptitude since it first came out in Beta. At the time no other GIS program coiuld handle the environmental justice/toxic mapping that I was doing. I used Maptitude and GISDK to create the very first nationwide toxic mapping for EDF. Maptitude still is the most powerful, easy to use and cost effective solution out there. I highly recommend. Nothing comes to mind at all. Since the Beta version, Maptitude has done everything I ask of it and support is superb. Absolutely the most powerful, easy to use and cost effective GIS program. GIS mapping for environmental justice, toxic mapping, pollution mapping. "Top Quality Spatial Analysis Software! Can't find anything similar at the price. " I have used Maptitude over 15 years and in numerous different countries. Maptitude is very easy to learn, and is designed for USERS - so users can do numerous spatial analysis modeling, and of course create great looking maps. Although they have extremely great data sets for numerous countries, such as USA, Australia, etc, they don't have any data sets for my country of Fiji.. But, none of the GIS companies do. The USA dataset they provide with the software (I think still us$695) would cost 5-10 times that if from other countries. Unless you are large company creating GIS shapefile such as utilities, government land departments, etc, and you are predominately a 'user', Maptitude is a very simple easy, but powerful GIS software. I previously worked in a government agency where we had one full time GIS person who used ArcGis. But I could create better and faster maps within Maptitude, and sadly, the GIS person was let go as agency did Maptitude training for all project coordinators and project managers who could then easily do their own maps. Saved agency one full time salary staff, saved time for others, and saved substantial money in software. For most GIS / spatial analysis functions, you don't need the over built ArcGis that requires a degree to operate. Maptitude allows the 'user' to create their maps of their data. I am in real estate / property industry, and use Maptitude for trade area analysis, site selection, and creating quality custom maps for my reports. Trade area analysis is awesome as built in are numerous types such as radius, drive-time, etc. With a little extra skill, I completed complete retail gravity (Huff model) trade areas, weighted on different features. I also taught spatial analysis to real estate students at university, and Maptitude was our software choice. "Efficient Software that's very user friendly"
Using the Maptitude software to separate my territories for me has saved a great deal of time. I've had trouble with having the software not give me available routes when I have multiple sales reps attached to the same zip code. Apply for the demo. That'll win you over immediately if you need any of the functions this software provides. I'm gaining new business without adding drivers or spending any more money. Thank you for the positive feedback Jayson! Not as easy as Mappoint. The interface does not provide for easy roll-ups, but you can do roll-ups once you figure out the process. By the way, support is fantastic about helping on specifics. Works for clients in USA and Canada. "Quite the best mapping experience I had." I like how fast it is, I like the fact that is not online (compared to some other software) and I like how deep you can go with the software. Well, in my case I didn't have all the catalogs, only the Canadian one. Therefore I wish I had all of them. Nonetheless, I think what I dislike is the support that I had when I tried to reach out to Caliper through their Facebook account. I have to admit that once I sent an e-mail to sales, I got a reply within a few hours. Do not even hesitate to go for Maptitude. There is more-than-complete user guide as well as numerous tutorials on YouTube. Without disclosing anything, I mapped where our customers (in terms of longevity) were churning. Therefore, I had a great idea where competitors were "attacking". Putting it on a map made it easier especially when you have an enormous data set. "MAPTITUDE ENHANCES OUR LICENCING SERVICES"
MAPTITUDE is easy to use yet powerful. When we have needed to ask questions the support has been fast, polite, professional and resolved our need to know how to do something. It has enhanced the service we offer our clients. There is nothing we do not like in MAPTITUDE. Able Medico provides medical licencing services to client. Our applications to government healthcare authorities need to show locations of proposed equipment or practices, proximity to other healthcare organisations, patient catchment areas, incidence of illness by statistical local area and much more. Prior to MAPTITUDE our submission was based on WORDS rather than VISUALS. Maptitude has made it easier for us to build submissions and easier for healthcare authorities to review and approve. MAPTITUDE has also enhanced the professionalism of our practice in offering the service. Thank you for the positive review Mark! Please let us know whenever we can be of assistance with Maptitude. "Very powerful compared to MapPoint"
Maptitude is a full GIS which has been replacing Microsoft's discontinued MapPoint product. Compared to MapPoint it is much more powerful, allowing for more 'out of the box' analysis, richer data, and a more powerful API that exposes more 'under the hood' functionality - ideal for custom programming solutions. The 2016 version of Maptitude adds some territory functionality. This isn't an area I use, but the new implementation fixes the biggest problems with MapPoint's territories (ie. support for partial geographic areas). The Route Manager has also been revamped and is much more powerful and usable compared to the version in 2014 & 2015. Users familiar with MapPoint & Streets&Trips will find the functionality familiar. Being a 'full GIS' means Maptitude can do an awful lot of things. This means there is a much steeper learning curve compared to MapPoint. It also means the base cost is more, but this is still substantially less than most GIS systems on the market (e.g. ArcGIS). Caliper and a number of third party organizations offer training classes. These could be useful to get you started. Primarily using Maptitude to solve geospatial problems for my customers. Many of these include route distances - for example, finding the efficient location of sales offices to meet known customer location needs. "Great GIS for Beginners and Experts"
Maptitude just works! The intuitive interface, and comprehensive documentation and videos allow users to get started quickly. The additions to the data sets and the functionality when we upgraded from Maptitude 2013 to the 2017 version were pretty amazing! Really nothing to dislike so far, other than perhaps the fact that i want to do more with the software. I feel like we're only scratching the surface. Time to schedule some training with the fine folks at Caliper. Do it... you wont be sorry! We now build our franchise territories with ease. Our organization has benefited from our ability to strategically plan out prospective territories, gauge market penetration of our active franchise territories, and begin to identify what our top performing territories have in common. This really is pretty easy to use and the data that is included is quite extensive. Real estate site analysis and customer profiling. At my company we're pretty heavy into automation. Maptitude offers very user friendly automation of maps. We have clients that need maps created for over 300 stores. Imagine having to manually create 300+ maps. Maptitude can generate those maps in about 20 minutes. At this point I haven't found anything that I really dislike. Maybe as I dive deeper with other projects I will find something. I've used several other mapping products over the years that cause me a lot of grief with crashing, etc. So far so good with Maptitude. We're helping clients see where their customers/prospects reside by providing them with a very nice map. So far our customers have been very impressed with the detail we've been able to provide on the maps using Maptitude. For a reasonably priced GIS software, the depth of data and the number of tools available to analyze and map the data is fantastic. The ability to export reports and images is also great. While the software is extremely powerful it is not very intuitive or user friendly. I only use the software every couple months and I feel like I have to relearn it every time. We use it to analyze healthcare data and identify locations for medical real estate projects. We've been able to make very informed decisions. Easy to use and affordable. no need to upload information or customer database. all Info stays on your computer and not on the cloud. The most sophisticated and user friendly mapping software that I know is out there. I spent many months attempting to make ARC GIS adapt to my needs and then experimented with "light" mapping tools out there - this is the absolutely the best and am very happy with Maptitude for solving all of our business analysis needs. "Maptitude , great GIS software, that delivers.."
Caliper®’s Maptitude® product was brought to my attention in September 2014, when I was looking for an alternative for MapPoint. Since then I have used the program in my work as a logistics consultant on many projects both in Europe and in the USA and would recommend it to anyone who is in need of a professional, yet not complicated desktop GIS system. Key features are ease of use, versatility, flexibility in importing data, geocoding, endless possibilities to enhance maps with colors, to really tell the story of the data, powerful analysis tools. The help file is simply great, offering full explanation of every menu item, with a description how to use and 60 seconds tutorials/files to practise. So far a full European map is missing, however with a bit of effort one could create a European map with free available shapes and use this as a template.. I would recommend the use of this software to any one in need of a proper mapping tool, I spent quite some time investigating other options and finally decided to go for Maptitude, never regret it. Predominantly supply chain visibility, restructuring of delivery networks, center of gravity studies and cluster analysis. The benefits of visualizing data in a map are huge, critical decisions could be made by the clear representation of data in a few maps. Maptitude have all kinds of nice features. Routing and drive-time radius are by far the greatest. Not much. The new logos and icons layer is for US only. The program is mostly used for routing. It gives me the best route possible for residents to go fuel up their car. It is the principal factor you have to consider for gas station futur sites. "Best combination of power, ease of use, and price in a desktop GIS." High quality maps that require limited effort to produce due to advanced automatic labeling features. Also includes many spatial analysis tools that not usually available at this price point. Finally, the data that comes with the package is very comprehensive (cartography and demographics). Built-in attribute database requires some getting used to. However, Maptitude links to SQL and can both read and write many database formats. All GIS software requires a fairly significant investment of time to get a lot of value from it. I've used almost all desktop GIS packages and Maptitude is by far the best combination of power, ease of use, and price. The key to a good experience is to make sure that the user(s) are given the training and time to learn it and become productive. Mostly site analysis for commercial real estate. Very powerful tool in meetings where executives are reviewing a map with existing retail locations, proposed sites, competitors, and demographic profiles of trade areas. Maps and reports generated from Maptitude dramatically reduce the time required to make decisions because the critical information is readily available to all parties, including the ability to zoom in and out on maps projected on a screen. "Maptitude - full GIS that everyone can afford"
Maptitude is symbiotic with ESRI's ArcMap GIS as well as MapInfo. Use alone or with other GIS product. Market demand, supply, absorption, customer profiling, performance metrics for business and education. In educational performance metrics I with colleague M. Harry Daniels have a patent pending algorithm that can predict with much less than a 3% error the likely performance of a student on a standardized exam, and achievement; this is all done with external data. Maptitude has a lot of flexibility. It allows me to combine multiple data bases and prepare property maps that I use in my second career as a neighborhood planning consultant. I think it would be good if Maptitude allowed you to draw shape files that could then be used as layers to cut data, etc. A great product that I couldn't do without. Maptitude allows me to take information from many sources and create maps that can then be used in public meetings to help neighborhood residents make decisions regarding the future of their communities. Thanks for the review, Bob! Re: "I think it would be good if Maptitude allowed you to draw shape files that could then be used as layers to cut data, etc." Maptitude definitely allows you to do this. You can choose Tools>Editing>New Layer; then Tools>Editing>Layer Editing Toolbar. We would be happy to demonstrate this to you. Please shoot us an email. "powerful, well thought out, intelligently crafted, efficient, cost effective"
having worked with a few different GIS packages in the past, I'm impressed to note Maptitude is a comprehensive blend of best features that are more than likely to meet the needs of most users. Occasionally, turn around for a service request might take longer than expected/required. "My initial take on Maptitude 2016. " As a user of Maptitute for the past 5 years, I can say that I am continually impressed at the improvements that have been made with each iteration of the software. I use the software primarily for business/retail applications, institutional research, and in transportation geography (logistics) analyses. This past weekend, I had the opportunity to install Maptitute 2016 (64 bit architecture). Previous installations of Maptitude on my computer have used the 32 bit architecture. While the software loads even faster, my initial observation is in the icons and toolbar interfaces on the Maptitude desktop. While the icons are slightly different than in the 32 bit architecture; however, they are intuitive and relatively easy to discern. The most noticeable improvement is the on-screen regeneration speed, which is now super-fast. This is critical, especially when you have many layers on, or are labeling features. The faster speed means better productivity by the end user. Another improvement is in the area of CPU and memory intensive operations such as drive-time rings. Now, one can do drive-time rings out beyond the 240 minute (4 hour) threshold that existed in previous versions. I did an 8-hour drive-time (without running an overlay or report) using the street layer and it only took a minute to run the process and create the rings. The new territory tool looks promising as well, even though I have not had a chance to work with that as of yet. For the price, Maptitude 2016, is hands down the best desktop GIS software on the market. I would like to see lifestyle segmentation and consumer spending pattern data available. While it would be a nice added bonus feature; it does not detracts from all of the other features offered in the product. Excellent out-of-box software for the price. I use it often for business geography purposes, including trade area analysis, site selection identification, and logistics work. "Great GIS, Valuable Replacement for Microsoft MapPoint"
Basic geographic analysis capabilities, it's a lot of functionality for the price and not too difficult to learn. Speed at which map redraws, even on a faster computer. May be an issue with all geographic systems (GIS) and laptop graphics cards. This is a great replacement for Microsoft MapPoint, which was sun-setted in 2014 I believe. It's got far more features than MapPoint did; however it also takes quite a bit more training and practice to use. The price is relatively inexpensive for a basic geographic information system (GIS). Overall we are very satisfied with the product. "My Job Revolves Around Maptitude "
I like that when I create a mapping project, I can open it easily and quickly get back to work. I dislike that the color palette is always a little different every year when I upgrade! Why can't they leave those colors alone? Many options with this product! I hardly scratch the surface of Maptitude, and know it can handle just about anything! I use labels on my maps with information from the FFIEC. Ease of use and the most powerful GIS I've used for teaching and research. Mac version not available ... although I use bootcamp to run Maptitude smoothly! "Spatial analytics: the next big thing in big data"
Maptitude offers the best value for money. It costs half as much as the other software and packs as much, if not more, functionality. It can have a more modern looking user interface. If you are starting off in GIS and spatial analytics, Maptitude offers the best functionality and support at an affordable price. Put simply, it offers the highest return on investment for a GIS platform. I study and research urban economics, housing markets, and travel behaviour. Maptitude is part of my drawing board for analytics. I analyze spatial data by first mapping it and then running analytics within Maptitude and for advanced methods, I export data to other statistical software. "Excellent product...but you have to work for it"
Maptitude is a very flexible mapping platform with a robust demographics package available for purchase. It is an excellent tool to generate custom maps with and perform spatial analysis. Documentation is pretty basic. The web tutorials teach one how to use the rudimentary functions of Maptitude but in my opinion, not much more. If you want to make the software sing,you have to teach it the tune one your own. Maptitude is utilized in my real estate consulting practice advising clients on a variety of issues. I have found Maptitude to be a very cost effective way to fulfill the data needs of my practice. While ArcGIS may have a lot of features and open source maps, Mapititude is great for two reasons: 1. Its not a SaaS product. 2. Its demographic overlays are extremely useful. Lack of prebuilt maps. Sometimes the data overlay doesn't match the layer below. Seems like they are a few GPS coordinates off as a whole. Still trying to figure out how to properly create beautiful heat maps. They do have a CAD/Transit program, though we have no need for it in my role. Analyzing what similarities we have between offices. * We monitor all Maptitude reviews to prevent fraudulent reviews and keep review quality high. We do not post reviews by company employees or direct competitors. Validated reviews require the user to submit a screenshot of the product containing their user ID, in order to verify a user is an actual user of the product. Hi there! Are you looking to implement a solution like Maptitude?